You might remember from our visit to Dover Castle last month that we are really trying to make the most of our English Heritage membership this year before it comes to an end. So a couple of weeks ago we headed off to Battle Abbey to find out more about 1066 and the Battle of Hastings. We'd visited before with the boys before Miss T was born so we could remember a little about it from our previous visit. I remembered how much the kids loved the audio tour before so we used them again and even Miss T was keen to listen in. We did the outdoor part of the tour this time rather than the actual abbey as we all felt we needed an outdoors kind of day. 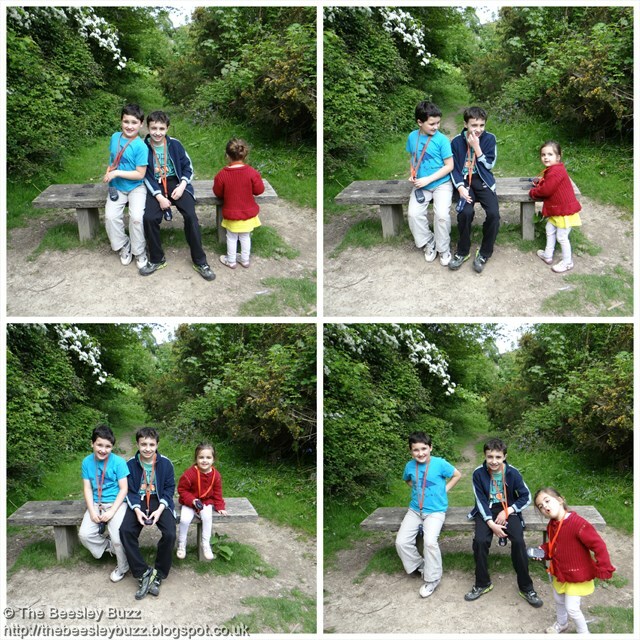 And I thought it would be the perfect opportunity to get my Siblings photo for May (I've missed the deadline for the linky but wanted to squeeze it into May on our blog at least). Here's one of the three of them listening intently to the audio tour. It was the kids version they did and it certainly did keep their attention. Moments after this, Miss T wandered off and tripped over so it ended in tears! But I like the picture at the very top of this post best. They all look so happy and relaxed together. I think being outdoors enjoying the countryside brings out the best in them all. And a few more pics from our day... I love this sheep - She looked almost comical with her big body on those little legs like one you'd see on Shaun the sheep! There's a fantastic challenge over on Foodies100 at the moment to create a Spring menu using Lindeman's wine in at least one of the dishes. Spring to me means fresh, green, and seasonal. So I really wanted my menu to reflect these elements. And just as Lindeman's is perfect for both everyday moments and special occasions, I wanted my dishes to be simple enough for everyday dining, yet special enough to serve when friends come for a meal. If we're lucky enough to get some warm weather, the main course can actually be cooked on a BBQ as an added #CaptureTheSunshine bonus! 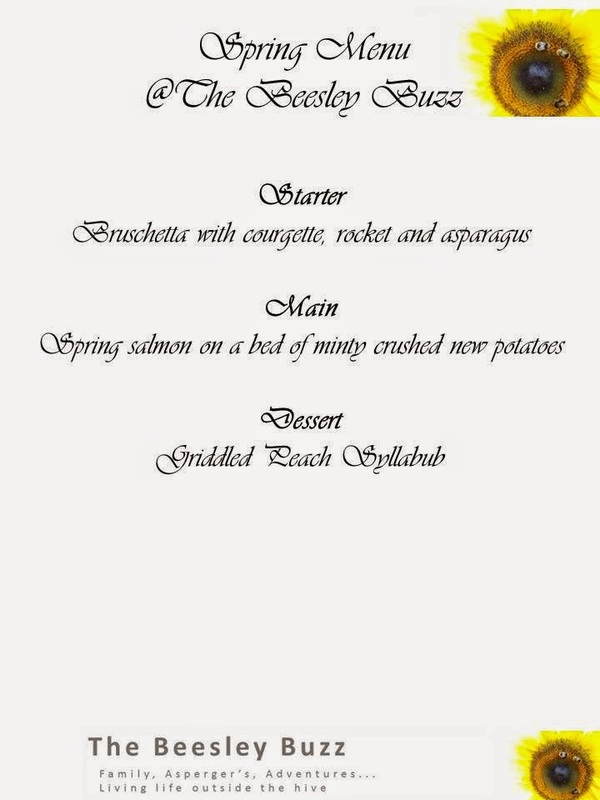 So here's the full menu with a splash of Lindeman's Bin: 65 Chardonnay in every dish. We love the versatility of this wine and so hope to show how it can run perfectly through my whole spring menu bringing out the best in every dish. Of course, the menu can also be served with Lindeman's Bin: 65 Chardonnay as the perfect accompaniment. Recipes are shown for 2 but just increase quantities for when friends are visiting. My quantities are usually approximate anyway so it won't spoil the recipe if you add a little more or less of an ingredient. Ingredients: 2 slices of ciabatta or similar bread, 2 cloves of garlic, olive oil, 150g fresh broad beans (taken out pod), half a courgette, 2-3 basil leaves, asparagus 6-8 stems - woody parts removed, rocket, zest and juice of a lemon, seasoning, splash of Lindeman's Bin:65 Chardonnay. 1. Crush the garlic, mix with a little olive oil and rub onto the bread along with the chopped basil. Griddle on both sides until browned. 2. Cook the asparagus and broad beans in boiling water for a couple of minutes and drain and run under cold water. Pop the broad beans out of their shells and cut the asparagus into medium sized pieces. 3. Using a peeler, slice your courgette into 'ribbons'. 4. Now prepare the dressing by mixing together the juice and zest of 1 lemon, a drizzle of olive oil, a small splash of the Lindeman's Bin 65 Chardonnay, and salt and pepper. 5. In a large bowl, toss a handful of rocket per person, broad beans, asparagus and courgette ribbons in the dressing to make a tasty seasonal green spring salad. 6. Place the bruschetta bread onto a plate and top with a portion of the green spring salad. This is a speedy recipe you can make using foil 'parcels' so they can even be cooked on the BBQ in summer! Ingredients: Responsibly sourced Salmon Fillets (120g portion per person), butter, handful of baby spinach per person, small handful of frozen petit pois per person, 3-4 basil leaves, 1 tablespoon Lindeman's Bin 65 Chardonnay per person, 2-3 tablespoons creme fraiche, 350g seasonal new potatoes, olive oil, fresh mint, seasoning. 2.Use a large piece of foil per portion. Place it into a container to fill with the ingredients. Add a knob of butter, then a handful of washed baby spinach, then a small handful of frozen petit pois, a tablespoon of Lindeman's Bin 65 Chardonnay, 1-2 tablespoons of creme fraiche and 1-2 chopped basil leaves. Then place the salmon fillet on top and wrap the foil into a parcel. 3. Repeat for the second portion. Then place both foil parcels on a baking tray and cook in the oven for 20 minutes until the salmon is cooked through. 4. In the meantime wash and boil the potatoes. Drizzle with olive oil and sprinkle on some chopped mint. Season to taste. 5. Serve by lightly crushing the potatoes with a fork and placing the salmon and on top. Spoon on the tasty sauce that has been created with the remaining ingredients in your foil parcel. Ingredients: 300ml double cream, 25g icing sugar, 4 tbsp Lindeman's Bin 65 Chardonnay, Tin of halved peaches, fresh mint, sprinkle of toasted flaked almonds, edible flowers eg strawberry flowers or forget-me-nots to garnish. This is such a simple dessert to make but tastes oh so yummy. 1. Place two peach halves per person along with a little of the juice/syrup from the tin into a pan. Add a couple of tablespoons of Lindeman's Bin 65 Chardonnay. Simmer on the hob until the liquid has reduced. 2. Then move the peaches to a griddle pan for a couple of minutes on each side. Then leave to cool. 3. Using a mixer with a whisk attachment, whisk the double cream and 2 tablespoons of the Lindeman's chardonnay until the cream thickens. Add in the icing sugar and briefly whisk to mix in the sugar. 4. Serve the cream with two peach halves per person on top. Sprinkle with chopped mint and a sprig of mint to garnish. Add a sprinkle of toasted almond flakes and add a couple of edible flowers if desired. So there is my full 3 course Spring menu using Lindeman's wine. Hope you like it! 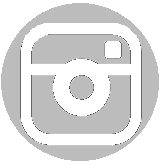 You can find @lindemanswines on twitter and @lindemans_wine on Instagram. This is my entry into the #CaptureTheSunshine Challenge. It's been a while since I wrote an update about Miss T and how she's getting on since getting a diagnosis of Juvenile Idiopathic Arthritis a few months ago. I find myself torn between wanting to pretend it's not happening, ignoring it and just blogging about the 'normal' stuff and showing all the fun Miss T has or facing the reality of her being filled up with medication each day in order for her to be able to walk, along with having to face needles too with a weekly dose of methotrexate and a blood test every two weeks to closely monitor the effects of the methotrexate. Like anything in life, I guess it is about finding a balance. I feel that she will need to know a little about what's been going on with her health as she grows older and as it's something that could well affect her own children or J and D's children, I guess it might be useful for them in the future to have some kind of record of what's been going on. It might also prove useful to someone else whose child has just been diagnosed with JIA. I know I find other blogs a huge source of information and support about all kinds of topics, and as JIA is not widely known about it might just be helpful to someone at some stage. I want to remember to include the fun stuff too so I will try to include some of the happy things Miss T is saying and doing. Even though the 'wot so funee' linky is no longer running, I still think of some of the things she says and does as 'funees' so will include some of her latest ones at the end of this post. A basic recap of Miss T's situation. Initially starting as a swollen left foot thought to be caused by injury, showed no signs of recovery and got worse after being immobilised in plaster. Right knee joint and right toe also showed swelling. After examination at Great Ormond Street, they found her right elbow to also be affected. Combined with my history of arthritis starting at a young age and how her joints were looking (swollen and hot to the touch), Miss T was diagnosed with polyarticular JIA (the poly bit meaning that multiple joints were affected). By the time we went to Great Ormond Street, this was actually the news we were expecting and hoping to hear. By getting a speedy, clear cut diagnosis we knew we could get a plan of action in place to get treatment started. A few weeks before that point, after various scans and tests carried out locally, it had been a shock to hear that it could be arthritis. Yet the timing was incredible as I had only days before been speaking about my experiences of juvenile arthritis at a conference. During the conference I'd heard about the importance of fast diagnosis (to prevent long term joint damage occurring) and the treatment options available (which was a lot more than had been available when my own arthritis started all those years ago). The research that was presented also showed that there are nasty side effects to treatment and some young people find it so tough, they'd rather live with the pain and long term damage that arthritis does than stick with their medication and treatment plan. The treatment for Miss T was to have a 6 week course of steroids orally and to commence the weekly methotrexate injections. The hope being that via injection, the methotrexate would have less chance of causing nausea. She was also taking naproxen as pain relief and this was to continue until the methotrexate was well established. Omeprazole was necessary to protect her stomach from the naproxen. Abidec to help with vitamin d levels. And folic acid is necessary to be taken when on methotrexate. We were also advised to get her eyes checked urgently as uveitis can also occur in conjunction with arthritis and left untreated, can have serious implications. She did have uveitis and was started on maxidex steroid eye drops 4 times a day. It's taken a lot of focus and organisation to make sure we get the right meds in her at the right time. She has for the past 6 weeks or so been taking medication of some sort around a dozen times each day. Today her steroids have reduced to 5 mg from the original 15mg and her eye drops are down to once a day. So in some ways it feels like progress. The pain is still there so there is no sign of being able to reduce the naproxen yet. She is also feeling nauseous occasionally. And she is still on a LOT of medication but the end of the steroids being in sight has helped. They have made her grumpy which is not like her at all so we will be pleased when she can end the steroids completely. She had to be rushed to hospital for the vzig jab when someone at her preschool came down with chicken pox. We live in constant fear of other illnesses as her immune system is compromised because of the methotrexate so even relatively mild illness can have serious complications for her. Thankfully she sees to have steered clear of infection so far. Long may that continue because sadly the methotrexate is here to stay for some time. They reckon around a minimum of 2 years of weekly injections. 2 years. That seems like forever for a child. Yet thankfully she is too young to have grasped that sort of understanding of time so we are just taking each day and each week as it comes. I'm so glad for many things. I'm glad that we have just two more weeks of the steroids, then hopefully these can be dropped. I'm thankful that despite the pain she does have, the pain relief does enable her to walk (I was bed bound for months when my arthritis began), I'm glad that we are carrying on with 'normality' as much as possible, I'm glad that there has been enough progress in the last 30 years that there is treatment available. 9/4/15 J says I want a bath rather than a shower. Miss T replies 'but you're not a giiirl' (as if for some reason she thinks only girls are allowed to have baths and everyone else must have a shower). May 2015 - When she accidentally knocked her cup of water over 'Water jumped off the table!'. 11/5/15 - She has a lovely grobag from the gro company and as she struggled out of it one morning she described it as 'my sleeping bag hugging me'. 13/5/15 - When I passed her some rubbish to put in the bin, she already had both hands full with stuff she was holding and says to me 'I'm not an octopus!' as her way of explaining that she didn't have enough hands to help me. 19/5/15 - We found this one hilarious. 'I want a parachute' A parachute? we asked. 'Yes a parachute'. Then we realised she meant a 'sharon fruit' but she'd forgotten what it was called. 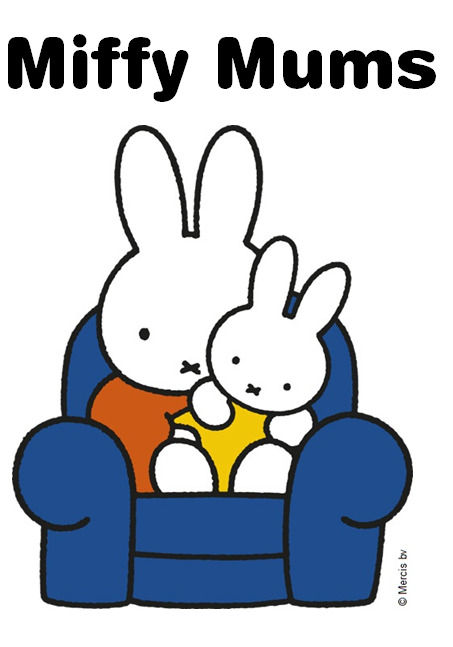 So a brave, funny littlegirl who is doing really well considering everything. Oh and she adores slides! I just feel the need to mention that this is Miss T's story and experiences and not to be taken as medical advice as everyone's case may be different. We just want to share her story to raise awareness of the importance of early diagnosis and treatment of JIA and to let others going through the same thing know that they are not alone. 'BE YOURSELF AS OTHER BLOGS ARE TAKEN'... that's just one of the clever blogging quotes on the Debenhams T-shirts they created to celebrate sponsoring the Lifestyle Category of the UK Blog Awards 2015. Here are the other cool T-shirts. Aren't they fab! And here's the blogger challenge they have set. To pick one of these T-shirts and show how you'd style it. You can read all the details over on The Daily Debrief here. I'd pick the t-shirt that reads 'BE YOURSELF AS OTHER BLOGS ARE TAKEN'. The reason for this is that blogging is similar to fashion in the sense that it is your way of being yourself and expressing yourself. You don't have to follow the trends, you don't have to explain yourself. Your blog is your own space to make your own and do as you wish. It's the same with styling an outfit. There are catwalk trends you could copy and get inspiration from the latest seasons styles but ultimately it's about doing what you want and wearing what you want to make it your own. I've created a moodboard to show the T-shirt with the items I'd add to style it into an outfit. I've also given a reason for my choices below. 1. The Collection Dark blue cropped jeans - It might sound cliche but you really cannot go wrong with a t-shirt and jeans combo as a starting point. Part of me wanted to dare to pick something other than jeans but these jeans would look so fabulous as part of this outfit that I couldn't resist. 2. The next key item in this outfit is this Red Herring Navy textured edge to edge blazer. Being an open fronted blazer, this is perfect to show off the blog quote t-shirt. It also adds a smart edge to the outfit immediately taking the T-shirt from a casual look to smart-casual. 3. Faith Off white leather wooden wedge high heel sandals - Again these are perfect for a smart-casual look making the outfit suitable to wear for a variety of occasions. 4. Now onto some key finishing touches. Both practical and highly stylish this J by Jasper Conran Designer White Curve Zip Grab Bag. I feel it would complement both the wedge sandals and the black text on white T-shirt itself. 5. Now to really bring the outfit to life with some quirky splashes of colour; This Joe Browns Green Funky Floral Headband is fun and unique. 6. Add a statement bangle as an additional quirky accessory and you'll really start to turn heads. This bright Principles by Ben di Lisi Designer Peach enamel polished bangle is just the thing to finish my outfit off perfectly. Well there you have it. I really hope Debenhams like my choices. I certainly had fun coming up with this outfit idea. And just as a very silly bit of fun, here is my 'selfie' as if I'm wearing the T-shirt. Originally Debenhams had hoped to send out a T-shirt to be able to take a selfie wearing it, but sadly they ran out so I've improvised using very crude cropping and showing just how unskilled I am with photo editing! But hopefully it will give you a giggle. This is my entry into Debenhams Style a T-shirt Comp. You can find out more here. I'm going to keep things simple today. Simple as 1, 2, 3 by sharing 3 ways of making playdates exciting. Playdates seem to feature heavily on kids' social schedules and when J was born we used to meet up every week with our antenatal group for the kids to have a playdate together. That contiued right up to when they went off to school. Not being part of an antenatal group this time around, Miss T wasn't born with a ready made group of friends but she has got a few close friends who we like to meet up with for playdates. Often they are happy just playing with their toys or popping out to the park for an outing, but sometimes it's nice to do something a little bit different to add some excitement to a playdate. Our own resident magician, 9 year old D, has got a few tricks up his sleeve to entertain his friends and Miss T's friends when they visit. First up is his balloon modelling skills. Kids seem to love balloons and what better than a fun dog shaped balloon. D has made a little video to show how you can mix up the magic on playdates and make your own balloon dogs. Another simple, fun thing that's been entertaining the children recently is rediscovering the fun of those folded paper 'fortune teller' thingamajigs. We made one to match the colours of the new Petits Filous Magic Squares - pink and yellow to match the delicious Raspberry and Vanilla flavour ones we've been enjoying. 3. 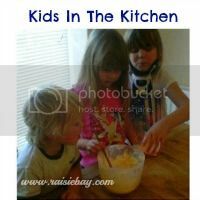 Make playdate food magic! And finally don't forget to add a little excitement to any snacks or meals that you have on a playdate. It's quite easy just to make a few little changes to get children really excited that they are having something 'different'. Here's a ham sandwich designed to match the colourful quadrant pattern of the Petits Filous Magic Squares along with some cheese and cucumber cut into square shapes. The delicious fun pots of Petits Filous Magic Squares are perfect for mixing up the magic just as they are. Miss T had never seen anything quite like it so we we keen to capture her first reactions on camera. Here's a little video of her 'mixing up the magic'. She loved the taste of the smooth vanilla and delicious raspberry flavour as she mixed hers all together in a flurry of excitement. I'm always keen for my kids to eat yogurts and fromage frais as a healthy alternative to other desserts. Whilst Miss T is on her methotrexate medication for her juvenile arthritis, her doctors have emphsized how much more important it is for her to keep up her calcium intake and with vitamin D and calcium these pots of Petits Filous Magic Squares are perfect as the vitamin D helps the calcium to get absorbed. We love mixing up the magic on playdates and Petits Filous have made playdates extra special with the Petits Filous Magic Squares range. This post is an entry for BritMums #MagicSquaresPlaydates Linky Challenge, sponsored by Petits Filous. Find out more about the Challenge here. retiresavvy - Old Age Pensioner or Over Active Pensioner? When we were asked by mumsnet to take a look around the new retiresavvy portal from Skipton Building Society, I really felt I ought to because we've always believed in being savvy with finances and planning for the future should be part of that. But in all honesty the thought of reviewing what I thought would be a boring finance site didn't fill me with excitement. So I clicked through, had a browse of the site, read some of the articles and felt inspired, energised and wishing away the next 30 years so that I could join this new breed of retirees. The site is clearly laid out with key sections focussed around 'Approaching Retirement' and 'Already Retired' along with a forum where you can register and ask questions and leave comments. As the retiresavvy community grows I can see the forum becoming a major benefit of retiresavvy and a real 'go to' place to ask not only about the nitty gritty of finance questions but also get to know others in a similar situation. Perhaps I should not have been as surprised as I was by the site as we have one of these new generation OAP's in our own family. At the time of writing this, Granny has been shortlisted in the final of the search for Britains most Over Active Pensioner. Granny was shortlised by the judges on her amazing merits of all the charity work she does along with her thrill seeking travels around the globe. Sadly the competition is a voting competition from here on (boo!) and we all know the problems with those as competition expert Di Coke so clearly explains here. So regardless of the outcome, Granny is always a winner in our eyes and she is a true inspiration to all retirees. Not everyone is going to be able to be a marathon runner or mountain climber in their retirement but everyone can make the decision not to be held back by their age and make the very most of life. And planning ahead financially can help make it all possible what adventures life has in store for you in retirement. We are so excited about catching up on the adventures of 11 year old Riley O'Chanter, or Rye as most call her. After reviewing the first Luck Uglies book last year, we couldn't wait to find out what life held in store for Rye, her three year old sister Lottie, and her mum Abby O'Chanter. Here we start in Mud Puddle Lane in the village of Drowning where the O'Chanters live in their cottage with their pet Shady. We got an uneasy feeling right at the very start when The Luck Uglies, a notorious band of outlaws, arrive at the cottage with a message for Rye. Rye's father, known to Rye by the name of 'Harmless', is the high chieftain of The Luck Uglies and has sent message for her to come to him at the time of Silvermas, a Christmas-like celebration complete with its own Santa-like character called Good Harper. Soon things start to get stranger as Rye realises she has been used as bait and she and her father Harmless retreat to a secret hideaway - A castle-like house known as Grabstone. Finding they are no longer safe in the village of Drowning ruled by the wicked Earl Longchance and his new evil sidekick, Constable Valant, Rye and her family need to escape. This time The Luck Uglies aren't in a position to come to the rescue as they have troubles of their own with grave divisions within their brotherhood. So the O'Chanters are left with no choice but to head to Abby's birthplace, the Isle of Pest. Upon arrival in Pest, the whole mood of the book lifts and I felt a sense of freedom away from the oppression and dark streets of Drowning. Rye's closest friends Quinn and Folly join her on her adventure in Pest and for a while it seems things are going well as she gets to know her grandfather better and makes friends with some of the other residents of the Isle of Pest. But it isn't long until the wicked Earl sends his constable in search of Rye and her family and the plot starts to take some interesting twists and turns. And just when you think they've won (I won't say who), the pace picks up even more in a nail biting finale featuring some of the other characters we met in the first Luck Uglies book. Once again this book had the potential to be too scary but thankfully wasn't - it was jam packed with adventures that tweenagers and teenagers would enjoy and so I felt very happy for both J (age 10) and D (age 9) to read it. It's a book that appeals equally to girls and boys. Well done to Paul Durham for a fantastic second book in the Luck Uglies trilogy. It reads brilliantly alone and is also great if you have read the first Luck Uglies book too. Can't wait for the third one! 1000 copies of Luck Uglies to giveaway!!!! Harper Collins are offering a copy of the original Luck Uglies book to the first 1,000 people who sign up to their mailing list here. Good luck! 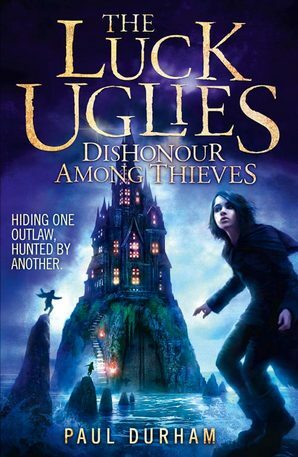 We were sent a copy of Luck Uglies: Dishonour among Thieves for the purposes of review. You can purchase it from on Amazon here. Giveaway is by Harper Collins and not The Beesley Buzz so please see the full Terms and Conditions on their website. Book cover image courtesy of Harper Collins. Ever since J played a Kirby game last year at a Nintendo event, he has completely loved him. So when we were given the opportunity to preview the latest offering in the series, there was no stopping him! In Kirby and The Rainbow Paintbrush we start by seeing our plasticine hero witness a mysterious hand appear through a portal and watch it steal all the colours from the world. A magical paintbrush arrives to recolour Kirby and his friends and off they set to conquer numerous levels, overcome baddies and bosses, and try to defeat the hand forever. On the Wii U, the main player controls Kirby using the game pad, drawing a rainbow of paint for our hero to roll along. Up to three other players can join as Waddle-Dees, whose job is to help Kirby in his adventures. We found the controls for both Kirby and his assistants both simple and intuitive and each member of the family picked them up in no time - even mum was able to complete levels as Kirby and three-year old miss T loved being a green Waddle-Dee! Each level offers new challenges, and Kirby takes on new features - submarine, tank, rocket... the advantage of being made of plasticine is you can change form to defeat the baddies! We truly love this game. It has been a very welcome addition, with the whole family joining in. You can see our love for Kirby in previous blogposts like our Kirby Triple Deluxe review and our Kirby Craft video in this blogpost. So we know we are going to keep enjoying Kirby for a long time! As Nintendo Family Bloggers we were sent a demo version of Kirby and The Rainbow Paintbrush for the purposes of review. All opinions are our own. At the supermarket last week, Miss T spotted a Postman Pat cake mix packet and for a mere 99p. I thought it was a bargain for getting a bit of quality time with Miss T in the kitchen. The great thing about using a kit is that it is so easy that Miss T was able to sit at the table so it was a bit easier on her arthritis than standing on a chair to reach the kitchen workshop as she often has to do. She got the paper cases set up in a muffin tray and had great fun mixing the cake mix together with an egg and a little water. She also loved mixing the icing sugar with water to make a paste. I left it entirely to her to ice the cakes and put the Postman Pat wafers on. She really had fun.